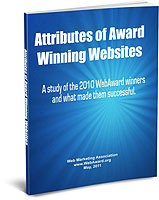 Attributes of Award Winning Websites – A study of the 2010 WebAward winners and what made them successful is a new study now available from the Web Marketing Association. Our goal is to provide the Web development community with insights into current industry trends by examining various aspects of websites selected as winners in the 2010 WebAward competition for website development and comparing them to those entries that were not selected as winners. To enter the 2011 WebAward competition for Website Development, please go to the WebAward.org Website. 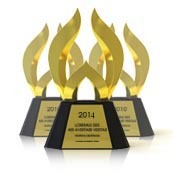 What is the best way to win a WebAward from the Web Marketing Association? To enter of course! However there are ways to improve your chances when the judging starts. Since April 1st, tips and hints have been posted to the Web Marketing Association’s Facebook Fan Page to help you position your entry in the best possible light. So here are the first 10 tips to get a step ahead of the competition. The judges use the audience and mission statement to get a sense of what you are trying to accomplish. It puts things into perspective for them. If you are too vague or worst too long winded, the judges will go on what that think the goal of the site should be and it may not be what you expect. Some agencies like to have a single landing page for all entries submitted to an awards show. This might make things easy for them, but it can be a nightmare for the judges. Creating a landing page is not required, but also acceptable as long as it is only for the entry under consideration. Judges click on the link and expect to go to the site, not have to search through many potential sites to fine the one they need. Make it easy for them. Entries cannot be submitted to the judges until the entry fee is paid. You would not believe how many nominators wait until the final deadline to submit their site and then have to submit a check request! If your company requires you to pay by check, use May 1st as your deadline and get the site submitted and the check request processed to get your entry viewed by the judges in the first round. When we ask for a URL, we want only a URL. If you type “www.webaward.org (go to the bottom of the page first)”, the judges will click on the URL and get an error message. This holds up your site being reviewed and makes us work harder. If you have something you want the judges to know, add a “NOTE TO JUDGES” at the beginning of your audience and mission statement. WebAward Tip #5 – -Have someone from your organization become a judge. One of the most prestigious awards given out each year is the Top Agency award, given to the agency which wins the most awards in a given year. If your agency has multiple offices or international offices, make sure they submit their entries also. We will combine all offices of the same company to count for that award. Every year sites are disqualified because the nominator had a typo in the URL or the server moved or the username expired. Don’t let this happen to you! If the URL changes, email us and we will update it. Make sure the user name and password (if necessary) are valid until August 15th to be sure the judges can access the site. It’s not just major enterprise websites that win awards. Sometimes it is the microsite, a site dedicated to a single product or concept, that does very well. You can also submit a section of a larger site (i.e. the investor relations section of a public company site). It all starts with the URL you submit on the entry form. The best way to pick the category your site will compete in is by saying to yourself “What would be best for my marketing program if I win?” Many categories overlap because over the years people complained that they were one and not the other. The other thing to consider is how competitive the category might be. The “Mutual Fund” category is narrower than the “Financial Services” category and might be easier to take the top prize. However, Best Financial Services Website might have more cache for your marketing efforts. Sometimes the best idea is to enter both categories and double your chances to win. The international WebAwards accepts sites in ten different languages (English, Spanish, French, Italian, Russian, Dutch, Chinese, Japanese, Greek and Turkish) and our systems are designed to automatically assign foreign language site to judges who are fluent in that language. However, if an English version of the site is available it is always preferred that you submit that site as we have many more English speaking judges that other languages. To enter your website into the 15th annual international WebAward Competition for Website Development, go to www.Webaward.org.